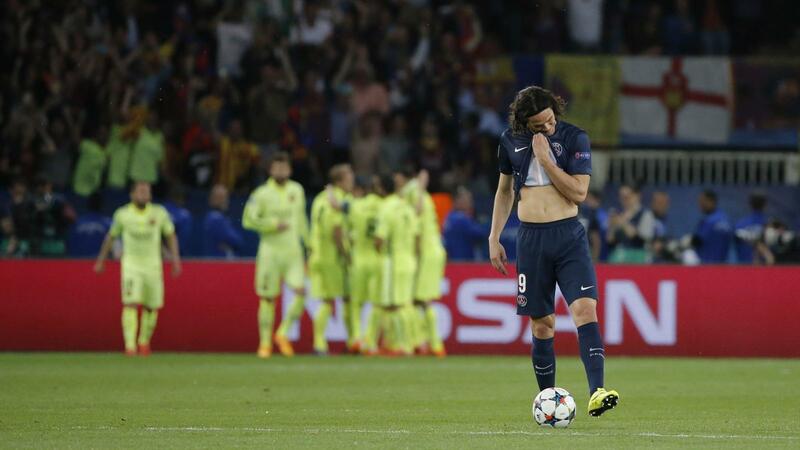 Well, the first leg of the 2015 Champions League quarterfinals has come and gone, and it was not kind to Edinson Cavani. The poor guy has enough to worry about already: constant transfer rumors, never ending stories about locker room strife, the fact that we’re less than 3 months away from the Copa America (where he will have to step into Luis Suárez’s shoes as La Celeste’s main scoring threat); there’s a lot of weight on this guy’s shoulders, and it got a lot worse yesterday as Barcelona traveled to Paris to face his PSG squad. I mean… what’s a guy to do, right? You’re one of the 10 best forwards in the world, scoring goals of all makes and models for both team and country, and everyone always looks at you like you smell of onions, just because you have the bad luck to always get paired up with larger-than-life, mythical strikers. And then those guys do something really stupid and have to miss a game or 18, and you’re left holding the bag. So there you are, playing in your team’s biggest game of the year, trying to make up for Ibra’s temper-fueled vacation, and here comes Luis (who got a little peckish last summer and now won’t be around to help you defend Uruguay’s 2011 South American title), showing the world how it’s done on the biggest stage possible, almost daring you to step up and take your best shot. Which, by the way, you do, just a few minutes later. But Barcelona’s keeper doesn’t just wave sadly at the ball as it goes by; he flies through the air and steals the wind right out of your sails. How could your day possibly get any worse? Oh right, I forgot: Suárez wasn’t done rubbing your nose in it. My mistake. And what in the world is David Luiz doing? Does he have Suárez on his CL fantasy league team or something? I haven’t seen that much nutmegging since my third grade class took a field trip to the eggnog factory. So, that was Cavani’s day. What, you thought this was going to be another one of my fawning Luis Suárez write-ups? Get real. What the hell could I possibly say about that performance? All I can do is watch the footage over and over and marvel, and have my hanky ready for poor Cavani. It’s OK, Edi. You may not be as good as that, but don’t feel bad. No one is.